Ars Technica's crack ninja infiltration squad somehow snuck into the Jobspod and snatched up a copy of the full email his Steveness sent out to Apple last night. – MobileMe was simply not up to Apple's standards – it clearly needed more time and testing. – Rather than launch MobileMe as a monolithic service, we could have launched over-the-air syncing with iPhone to begin with, followed by the web applications one by one – Mail first, followed 30 days later (if things went well with Mail) by Calendar, then 30 days later by Contacts. 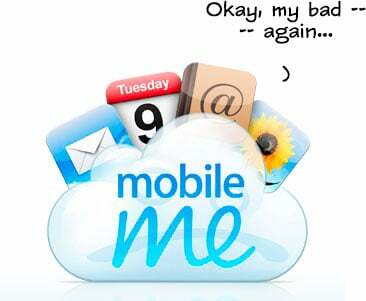 – It was a mistake to launch MobileMe at the same time as iPhone 3G, iPhone 2.0 software and the App Store. We all had more than enough to do, and MobileMe could have been delayed without consequence. We are taking many steps to learn from this experience so that we can grow MobileMe into a service that our customers will love. One step that I can share with you today is that the MobileMe team will now report to Eddy Cue, who will lead all of our internet services – iTunes, the App Store and, starting today, MobileMe. Eddy's new title will be Vice President, Internet Services and he will now report directly to me. The MobileMe launch clearly demonstrates that we have more to learn about Internet services. And learn we will. The vision of MobileMe is both exciting and ambitious, and we will press on to make it a service we are all proud of by the end of this year. That's not a timeline that makes us happy, but the fact that it's at least a bit more realistic does inspire some confidence.